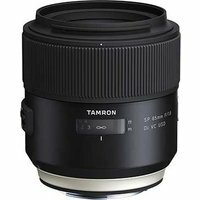 The Tamron 85mm f1.8 SP Di VC USD lens with Nikon fit is the world's first 85mm fast-aperture full-frame lens with image stabilisation (as of Feb 2016). Designed for portraiture, this medium-telephoto lens delivers edge-to-edge sharpness and superior low-light performance thanks to its fast f/1.8 aperture and Vibration Compensation (VC) system. It also features Tamron's new stylish SP design with moisture-resistant construction, together with LD (Low Dispersion) and XLD (Extra Low Dispersion) glass elements in the optical design to minimise colour fringing and to achieve outstanding sharpness and clarity.